Have you heard all the great things that essential oils can do for you? These oils have been around for hundreds of years. They come from plants so they are good for you. Oh yeah, you can make money and a living from selling these oils. If you have heard any of these things you may be dealing with a friend or family member who has joined Young Living. Now you are asking yourself “What is the Young Living Essential Oils Scam? This is a great question and one that I’ll answer in this Young Living review. My focus will be on the business opportunity and not on the pros or cons of the Young Living products. Donald Gary Young founded Young Living in 1993. He worked as the CEO of the company until 2015. At that time his wife and co-founder took over as CEO. Also in 2015, Young Living went over $1 billion in sales. The company sells it’s products internationally. Since it’s creation over 20 years ago, Young Living has become one of the larger multi-marketing companies in the world. The main products of Young Living are its essential oils. I personally don’t know much about the essential oil industry. According to Wikipedia, essential oils have been around for hundreds of years. The oils are withdrawn from a variety of plants. The oil for each different plant has it’s own characteristics. These can bring mental, physical and spiritual benefits to the user. If you get involved with Young Living, you’ll want to do some study of essential oils so that you understand what you will be selling. According to the Young Living website, they provide a high quality product. They provide descriptions on their website on how they extract their oils. Many of the reviews that I checked out agreed that their products are of a high quality. There was a lawsuit from a competitor company claiming that Young Living products were not truly organic as claimed. Young Living Compensation Plan – Click to go to source. As can be seen, the compensation plan is not simple. Did you notice the commission on the products that you sell? It’s 8%. For every product you sell, you get an 8% commission. That’s pretty small. Of course you can also earn on the sales of your down line. 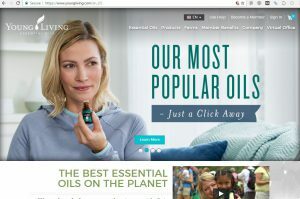 What Is The Young Living Essential Oils Scam? Straight answer is that Young Living is not a scam. Then why would anyone consider it a scam. As a MLM company, Young Living is setup so the people at the top make a lot of money and those at the bottom lose money. This is due to the pyramid structure. The compensation plan above shows that the more people you recruit the more money you will earn. You get commissions on all of their sales plus bonuses for different levels of the structure. From the above statement, you’ll see that 93.1% of the members only average $12 per year. 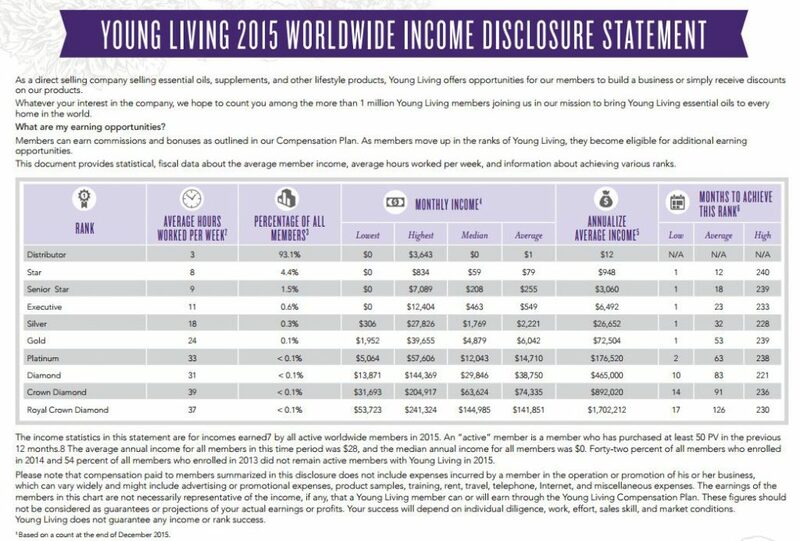 Also note that when you add up the first four ranks, you get 99.6%(93.1 + 4.4 + 1.5 + 0.6) of the Young Living membership. The high average of the 4 ranks is $6,492 per year. What this chart tells you is that only 0.4% of it’s membership has achieved a rank greater than Executive (4th level). 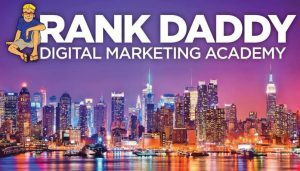 Those that are making real money in Young Living are in Gold rank (6th level) or higher. Young Living has a good product that has become popular over the last couple of decades. Some say the product is overpriced. Young Living is an MLM which is a poor choice for a business opportunity. The commission at the first level is low at 8%. The compensation plan is a little complicated. As can be seen by the income disclosure statement, the vast majority of their members don’t earn a reasonable income. If you must join a MLM company, Young Living is one of your better choices but I would recommend against joining any MLM. There are much better business opportunities that you can join with low cost of entry. Let’s say you want to sell essential oils as your business. You could create a website where you discuss essential oil and provide reviews about different oils. Of course, you’ll sell essential oils on your website. Your question may be where do you find products that you can sell on your website? Most major brands have affiliate programs. This is where you sell their product and you receive a commission. This can even be done with products on Amazon. Hi Steve, very interesting article, like you I also advise against joining any type of MLM company, the way the pyramid scheme works is pretty ghetto in my eyes, and I think that would cause a lot of members in the MLM to eventually end up working against each other than with each other, trying to steal sales and whatnot, so long as your not in the same line of the pyramid. I have also had interest in looking into oils however, as I do want to look young as long as I can! I don’t believe there is much issue with stealing sales. The focus in most MLM’s is recruiting and the sales is secondary. At least that has been my experience with MLM’s. The essential oils seem to have all kinds of promised results. They have been around for centuries and yet still not proven. For me, that’s another sign of a business that I want to stay away from. Hi Steve, thanks for this breakdown of how Young Living Essential Oils is an MLM. I read it with great interest, because I come from a background in alternative medicine. I would meet people from time to time who swore by their Young Living oils, and said they were so much “better” than the competition. years ago I looked on the young living website and saw that they had really good promotional materials. now, not to comment on the products at all, but approaching it from a “purity” and “quality” standpoint seems to be working really well for them financially. Or, about 3% of them, as you point out. As someone who bought and used essential oils every day, for over a decade, I never felt YL was worth my investment, particularly because the cost was so much higher than other brands that also had strong codes of ethics about purity and quality. It’s good to hear from someone that knows something about essential oils. In my research of the different MLM’s, I find that the MLM products are usually higher cost than other brands on the market. Most of the time (there are some exceptions) the products are average to low quality compared to others in the market. My guess is that the MLM needs to pay several levels of the organization commissions on the product sale along with bonuses and that these commissions and bonuses drive up the cost of the product. Hi, I wanted to comment because I use Young Living Essential Oils. I am working toward achieving the rank of Executive. When I first got my kit it cost $150 plus tax. I compared this to amazon price and it was much cheaper (over $200). I felt that is was a good value. Knowing little about their promise to purity, I bought a few other oils from misc. sellers. I found a strong odor in the tea tree from another company. The Lavender I bought from a competing company gave my husband a bad headache and the peppermint scent did not last. I am sticking with my young living oils. I keep my other oils to show people the difference. It is obvious. Also, I am making money with this business – about $200. I do not pay for my “over-priced” oils, my commission covers that. There is no opportunity to get oils free from the health food store or amazon. If you are consistently holding classes and selling kits your oils will always be free. It does not take years to make thousands in this company. I know many people (Personally) who have retired from their full-time job in the first year of business with YL. I’m not talking millions…. 70k give or take. If this is considered a pyramid scheme then I ask you to take a look at whatever company you work for. Does your boss make more than you? I’d hope so, or he/she is getting ripped off! Just some food for thought. Thanks for the comment. It’s always good to get different perspectives on these programs. Your comparison to a boss in a normal company vs a MLM is a very poor comparison. Yes, a boss gets paid more than their employees but that pay is not normally based on how many employees that they recruit into the business. An independent consultant with a MLM company gets paid additional money if they recruit more consultants. Of course this is still over simplified comparison. MLM’s in general are a legal version of a pyramid scheme. They are legal because their purpose is suppose to be to sell the product. If the focus of the MLM company is strictly recruiting new consultants and no effort is made to sell the product other the purchase for self use by the independent consultants then the MLM crosses into the illegal pyramid scheme. From my research, Young Living puts a lot of effort into their product and the sales of their product. Young Living appears to be a legit MLM company. You can check out what the FTC has to say about MLM’s and pyramid schemes here.